"Offshore", "tax haven" and more recently "Panama in the EU" are labels that Malta has done its best to shake off. But when a team of journalists declared that the tiny Mediterranean island was a "pirate base for tax avoidance", it sent ripples of concern across the EU. Malta currently holds the presidency of the European Union, so the allegations are all the more sensitive. And they come at the tail end of a bitter election campaign that has seen the island's Labour government fending off serious claims of corruption, ahead of a vote on 3 June. What makes Malta so attractive? Malta operates a tax system where companies pay the lowest tax on profits in the EU. While local businesses must pay 35% on profits, international corporations profit from a corporation tax rate of as little as 5%, thanks to a complex system where shareholders can receive a tax refund of up to six-sevenths of their tax paid in Malta. The average rate in the EU is around 22%. So why should that upset the EU? Several EU countries say such a system damages their budgets and reveals a weakness in the EU, which allows the 28 member states sovereign rights over their taxation. According to a report commissioned by Green MEPs in the European Parliament, Malta helped multinationals avoid paying €14bn (£12bn;$15.6bn) in taxes between 2012 and 2015, which would have gone to other EU countries. The EU wants to stop companies setting up "letter-box subsidiaries" in countries solely to qualify for a softer tax regime. That is a situation the Maltese company registry is all too familiar with. The fight against tax avoidance is one of the European Commission's main priorities - its president, Jean-Claude Juncker, recently had to explain his own conduct as prime minister of Luxembourg. Is Malta the EU's Panama? On May 19, a network of journalists released their findings after digging into more than 150,000 documents. Describing them as the "Malta Files", the group said they showed how international companies were taking advantage of the Maltese tax system. 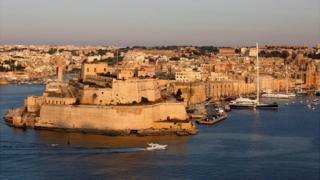 They also claimed Malta had become a target for firms linked to the Italian mafia and Russian loan sharks. It came just two weeks after Norbert Walter-Borjans, the finance minister in Germany's most populous state, North Rhine-Westphalia, singled out Malta as "the Panama of Europe". What are the Panama Papers all about? It is a highly sensitive subject for Malta's leadership, as just over a year ago one of the revelations from the huge leak of documents known as the Panama Papers was that the Maltese prime minister's chief of staff and a prominent minister held secret companies in Panama. Is Malta being unfairly targeted? Malta says it is under siege, insisting big countries are anxious to bite off a good chunk of revenue made by the EU's smallest state. The tax system has been jealously guarded by different Maltese governments, with successive prime ministers arguing there is nothing secretive about Malta's registry of companies and that controlling tax policy is the only tool left for small EU countries to remain competitive. After the "Malta Files" were divulged, Finance Minister Edward Scicluna told reporters: "Do not underestimate the attempts to bully a small country." Mr Scicluna has striven to explain that the Maltese authorities share company and banking information whenever asked to do so by foreign jurisdictions. Prime Minister Joseph Muscat added: "Our register is more transparent than Germany's or Luxembourg's. Our competitive edge is like giving a manufacturing company land on the cheap to encourage it to set up a factory in our country." Ex-Finance Minister Tonio Fenech told the BBC it all boils down to tax competition. "It's not Malta's problem that it has an attractive tax jurisdiction. It's the problem of other EU states that don't. Why should I increase my tax rates to please Germany or France? A lot of countries should look at the way their tax system has killed off business and led to unemployment." Mr Fenech served for nine years as finance minister and oversaw the tax system when Malta joined the EU in 2004. He said the island had nothing to hide. Its corporate tax system was sanctioned by the Organisation for Economic Co-operation and Development (OECD) and is in line with the EU's freedom of establishment. Mr Fenech insisted there was no fool-proof system anywhere to weed out questionable companies: "There's VAT evasion, money laundering all over Europe. What I can assure you is we have a lot of stringent rules." Malta's economic success has been overshadowed by corruption scandals that go to the core of the Labour government elected in 2013. The government has been under siege since the Panama Papers revealed details of secret companies in Panama. Those revelations have cast doubt on its ability to push through anti-money laundering legislation. Simon Busuttil, leader of the centre-right Nationalist Party, said the corruption that gripped the Muscat government was the main reason Malta was being subjected to closer scrutiny. The so-called Individual Investor Programme scheme, which enabled Malta to raise millions by selling its passports to rich foreigners, is at the centre of an inquiry, after Mr Busuttil claimed he had evidence to prove the prime minister's chief of staff was receiving kickbacks off the scheme. The European Parliament's "Pana" Committee, probing the Panama Papers, has summoned both Mr Muscat and his chief of staff for a hearing in June. Vice-chairperson Ana Gomes said: "All these scandals relating to Panama are harming Malta's image and the EU's. We're very concerned about the systems, or the apparent lack of them, to prevent the island from being used for activities of money laundering and proceeds of crime." Though Joseph Muscat and Simon Busuttil are worlds apart over the Panama Papers, they have both pledged to fight to convince the EU there is nothing illegal or immoral with Malta's tax system if they win office in elections on 3 June.